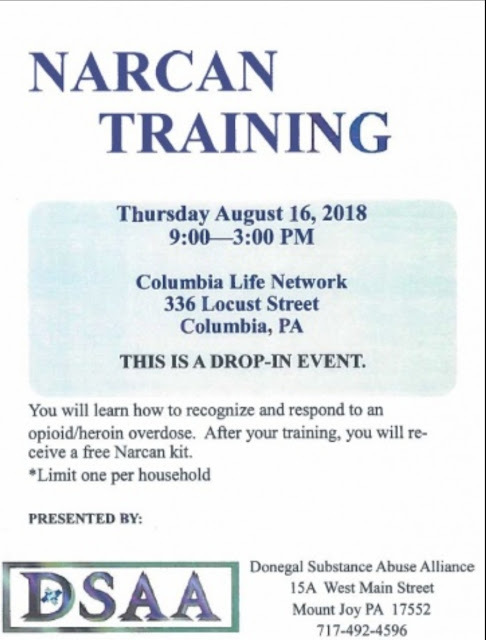 A Narcan Training Session will be held at the Columbia Life Network located at 336 Locust Street, Columbia, PA on Thursday, August 16, 2018 from 9:00am-3:00pm (drop-in). Attendees will learn how to recognize and respond to an opioid/heroin overdose. After your training, you will receive a free Narcan kit. (Limit one kit per household) The training session is being presented by DSAA (Donegal Substance Abuse Alliance/15A West Main Street, Mount Joy, PA/717-492-4596).